Alfred Nicol’s Animal Psalms begins with the baseball field’s organized uncertainties, and continues on many a trajectory of animal ruminations—with the human species well accounted for—ending in the imbalance of the everyday “Nuts” around us. The subjects include the elephant, snake, sheep, skunk, bee, couple dynamics, the trials and triumphs of the ruler or the everyman. This is a collection rich in aphorisms on the bright and shady spectra of our interactions. Recognizable soliloquies with the meditative self or dialogues with the beloved are unraveled for keen insights on the human condition—deconstructing them until the knotty connecting threads are exposed. Nicol gives us a mature collection of quiet reflection, with wit and wisdom deployed through finely crafted poems of masterly formal dexterity. Dear reader, I’ve fallen in love with this book, and that will happen to you too. Read, for instance, the very last poem, “Nuts,” and read the great “How to Ignore an Invisible Man,” and you’re hooked forever. Read all the rest, these poems by Alfred Nicol which have our numbers, and have his own too, that tell about our lives, and his, and the lives of snakes, and bees, and elephants, with such humor, and pity, and praise, for all of us, human and animal, in our situations. It’s impossible not to fall in love. 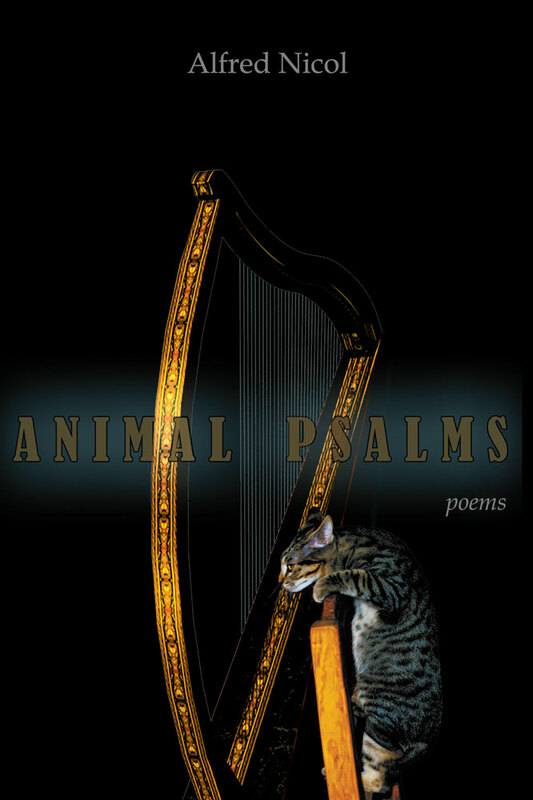 As the title Animal Psalms suggests, there is reverence here—a reverence that derives less from religion than from a religious attention to the things of the world, from baseball games to zoo elephants to the newly beloved. Nicol is a melodic writer, called first to the music of words, to “speech that lets the sound/ carry the greater part of what is said.” He’s also a poet whose images you won’t soon forget. They summon the real world and simultaneously render it otherworldly. While the poems offer moments of ecstatic escape, they’re more often held in check by an Augustan wit, ironic humor and a touch of Baudelaire. Poise and wit prevail in these psalms; they give us both despair inflected by light and illumination held fast by darkness. If we would only take the time to let one of Alfred Nicol’s poems sink in through the brilliant latticed grid of its formal exterior, how the truth of what he has to say about the human condition would hit us the way a line drive whips toward you on a dreamy summer’s afternoon, startling you back into the electric now. I love these poems because they evoke for me the zany, spiritual energy of the Beats welded as only a workman can work unwieldy things to the tempered grid of six centuries of formalism. Don’t be surprised if—after reading these poems—you find them turning back to their true subject, dear reader, which turns out to be none other than you. Alfred Nicol’s book of poetry, Elegy for Everyone, won the first Anita Dorn Memorial Prize. He received the Richard Wilbur Award for Winter Light. He has written lyrics in French and English for nine original compositions by classical/flamenco guitarist John Tavano. Their CD, The Subtle Thread, has received airplay on WMBR’s program French Toast. Nicol’s poems have appeared in Poetry, The Hopkins Review, Dark Horse, First Things, The New England Review, Commonweal, The Formalist, and other literary journals, as well as in Contemporary Poetry of New England and other anthologies. 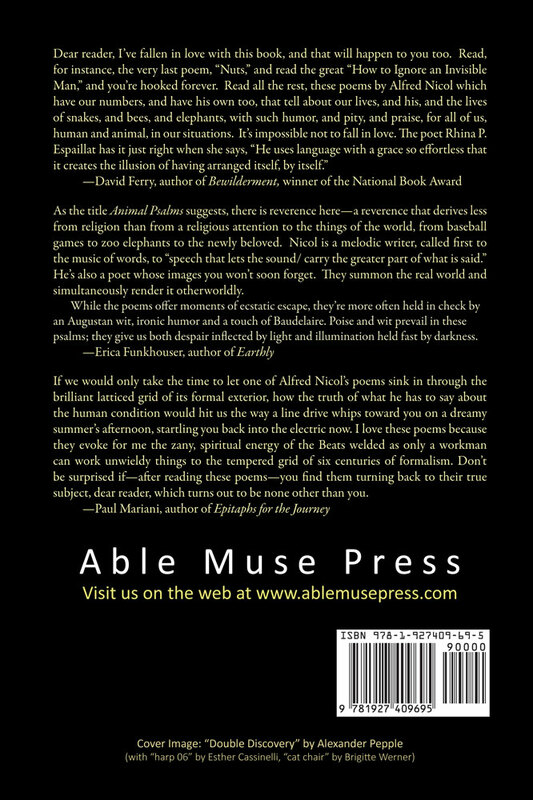 Animal Psalms was a finalist for the 2015 Able Muse Book Award.